In general, a man in a tuxedo creates a great impression. Referring to a formal evening wear, a classic tux consists of a standard length jacket that can be either single or double breasted. In view of the fact that tuxedos were considered as a formal occasion wear; it was available in some predominant colors. However with people who were fervent and passionate for colors, started looking for tuxedos on different colors which acted as a great inducement for the manufactures to extend their tuxedos with other vibrant colors like yellow and green. Worn for prom nights, evening parties and other informal gatherings, yellow tuxedos are bright and lively that makes you look fresh and enthusiastic. With that said, they are one of the finest spring-summer collections that look stylish and classy when worn. The best part about this color is that it looks exotic and is capable of meeting any man's formal standards. 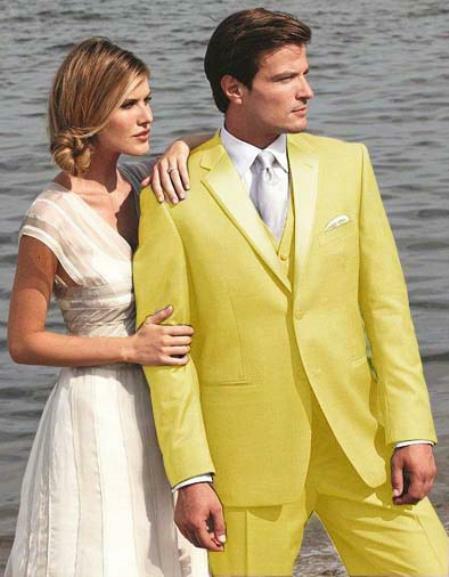 We at Mensusa offer you with a wide range of impressive shades of yellow tuxedo suits that are designed to match your requirement for any high profile party of even special events like weddings. Simply said it is a source of style that adds finishing touches to your personality. Mens Tail Peak Lapel Yellow Tuxedo Pre Order Collection "Delivery in 30 days"